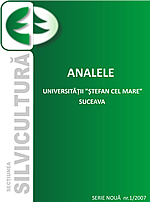 This is an academic journal published by Stefan cel Mare University of Suceava, Forestry Faculty. The aim of this open access journal is to publish original papers and reviews on forestry aspects of scientific research. Copyright © 2010-2016 Facultatea de Silvicultura Suceava. Toate drepturile rezervate. Site dezvoltat de dr. ing. Ciprian Palaghianu .